BRAWS delivers about 200 packages of pads and tampons each month to local PTA/PTSA programs, to include the pantries at Oakton, Woodson, Madison, Marshall and South Lakes High Schools as well as The Market of Manassas Park City Schools. Students in need can discreetly “shop” for nonperishable food and personal hygiene items in these school pantries. This is a wonderful example of community resources coming together to help students and their families and to make these necessary items easily available. 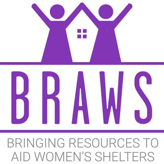 If you are a representative of your school's PTA/PTSA and are interested in bringing menstrual products supplied by BRAWS to your pantry, please email us at pantry@BRAWS.org to become a PTA/PTSA partner.